Located in Yuchi Town of Nantou County, in the world-renowned Sun Moon Lake Scenic Area, Sun Moon Lake Einhan Resort offers elegant accommodations designed in a combination of Oriental and Balinese style in creating a relaxing holiday ambience. This modern Sun Moon Lake hotel is only about 2mins walk away from lakeside, and with a number of local stalls and vendors at your fingertips, offering great choices of souvenirs for your Taiwan travel. Not only with easy access to the mesmerizing Sun Moon Lake, guests may also visit the Formosa Aboriginal Cultural Village, Wen Wu Temple, as well as experience a cruise ride on the lake or fun experience on the Sun Moon Lake Ropeway. 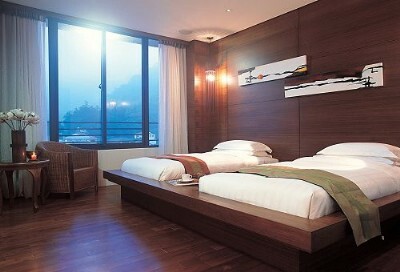 The wonderful location nearby Sun Moon Lake offers great ease for one’s Sun Moon Lake travel. ★ No pets are allowed.